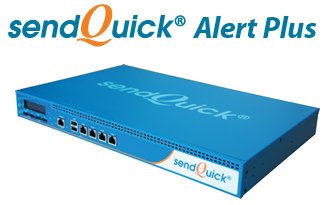 sendQuick Alert Plus is an appliance that facilitates pro-active (ICMP Ping) and reactive (SNMP, Syslog & SMTP) alerts across the entire IP addressable infrastructure in the Enterprise, supporting message delivery via SMS and email in the event of detecting failure. SendQuick Alert Plus offers easy integration with existing applications like email, database, application servers as well as infrastructure such as backup power management system, cable management system and network management systems with built in reminder and escalation features. It is rack mountable (1U) and supports an unlimited number of firewall, IPS, antivirus, UPS, network monitoring system, databases and other servers without the use of any software, providing greater value and convenience for users. It also supports file upload for SMS delivery. Lastly, it is scalable to support 32 GSM modems (1 comes free with the appliance) for modem routing based on operator prefix, route redundancy in the event of operator failure and for increased throughput. SendQuick Entera is an user friendly and cost effective appliance based solution for automated business process messaging across various departments like technology, marketing, operations, finance, administration for purposes like IT alerts and notifications, marketing campaigns and general broadcasting. Since sendQuick Entera is able to help companies automate backend enterprise messaging as well as to improve front end customer service and experience, the time and monetary resources gained can be directed to other important matters for the organization’s growth. sendQuick Entera facilitates enhanced pro-active (ICMP Ping, Port Check, URL check) and reactive (SNMP, SysLog & SMTP) alerts across the entire IP addressable infrastructure in the Enterprise, supporting message delivery via SMS and email in the event of detecting failure. SendQuick Entera offers easy integration with existing applications like email, database, application servers as well as infrastructure such as backup power management system, cable management system and network management systems with built in reminder and escalation features. sendQuick Entera is further enhanced with features like keyword management to route incoming SMS to other applications to facilitate interactive transactions and has unlimited end user licenses in the web interface. It is rack mountable (1U) and supports an unlimited number of firewall, IPS, antivirus, UPS, network monitoring system, databases and other servers without the use of any software, providing greater value and convenience for users. It also supports file upload for SMS delivery. Lastly, it is scalable to support 32 GSM modems (1 comes free with the appliance) for modem routing based on operator prefix, route redundancy in the event of operator failure and for increased throughput. 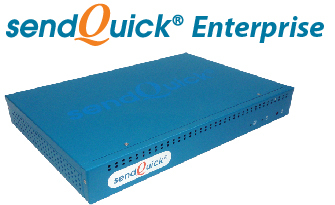 SendQuick Enterprise is a plug and play appliance that integrates well with existing applications, servers and networks with features designed to facilitate general SMS broadcasting. It is positioned as a user friendly and cost effective solution for automated general SMS broadcasting in a myriad of industries including government, healthcare, legal, medical, education, retail, logistics for purposes like emergency broadcasting, delivery notifications, job dispatch messages, inventory updates and marketing messages. 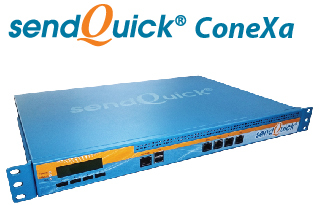 SendQuick ConeXa is an appliance that generates One Time Password (OTP) delivered via Short Messaging Service (SMS) which provides an added level of security working with any RADIUS based SSL VPNs that facilitate Remote Access. Users do not need to install any software and will be able to access corporate network via token-less authentication delivered via SMS on their mobile phones. In addition, easy integration to local, external directory or Microsoft Active Directory (AD) as well as the ability to support multiple SSL VPN sessions positions sendQuick ConeXa as a hassle free and cost effective solution for companies that are looking for enhanced Remote Access Security. Instant messaging first gained popularity through personal computers due to its peer-to-peer interaction. It did not take long for the same appeal to latch on to the mobile platform and it led to rapid proliferation among the masses. Mobile messaging has since become the norm for communicating freely with one or more users at the same time. Efficiency is a vital aspect in corporate communications. However, enterprise class mobile messaging applications do not exist. sqoope™ developed by TalariaX is an enterprise class mobile messaging platform designed to cater to the requirements of Enterprises. It features unique notification capabilities – like guaranteed messaging status – which ensures cohesive and coherent interactivity within a secure environment.